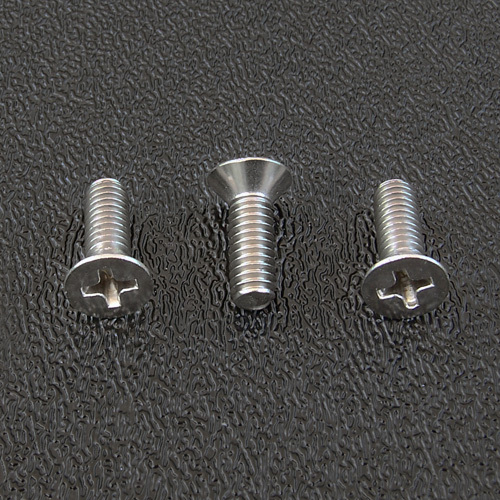 Stainless steel bridge top plate to tremolo block mounting screws for American Strat® tremolo bridges. Size: #8-32 x 3/8" length (standard) or 1/2" length, your choice. NOTE: The 1/2" length top plate mounting screws may require using a #8-32 bottom tap to open up the bottom of the mounting holes in the tremolo block. The holes are deep enough, but sometimes the threads are not cut to all the way to the bottom of the mounting hole with a bottom tap. The 1/2" screws are 1/8" longer than standard but provide more threads for a secure hold on the top plate. If you do not want to possibly open up the bottom of the mounting holes, then order the 3/8" length mounting screws instead. If you order the tremolo block at the same time as the 1/2" length screws we will automatically open up each of the 3 mounting holes in the tremolo block for you to ensure fit, no additional charge.